Researcher, Seamus Finnerty Centered in photo from Ballyeigh, Ballybunion, County Kerry Ireland. Please see letters attached. In the 1600’s the English takeover forced a change in most Irish names. MacGauran to MaGauran to McGovern, Maguire to McGuire, etc. Photo: Center Seamus Finnerty left- Kat S Dunbar right-Susan Mixson friend from Charleston. Note: According to the Registrar Office in Ireland, in the 1800’s and before; Irish Birth dates, Baptism dates and Registrar dates are not always recorded with the correct date of birth. Even today, in the waiting room at the Registrars Office (where I purchased the official birth records of our grandmother) we saw many parents with their children age 1 day to 2 years old getting their birth registered with the Irish Government. Therefore the birthdates of our Irish ancestors may be a little off but are officially acceptable to the Irish government. In 1921 a fire in Dublin destroyed all records prior to 1860. It is reported in the Altnadarragh 1900 census that 4 of the 5 people listed could not read. Only our Aunt Nora listed as able to read. 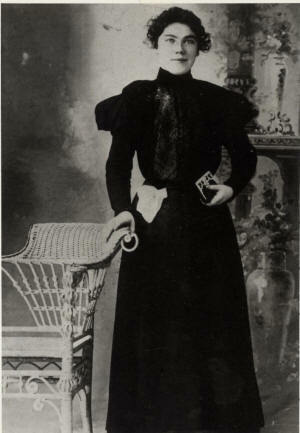 Our Grandmother Anne McGovern was born May 1877; her birth was registered November 1877. She moved to the US 1897 (Penn Yann, NY) with her sister Mary, to join their other sister Catherine (Kate) McGovern. Kate died in January 1900, is buried in Penn Yann, NY. Later that year Honora (Aunt Nora) McGovern came to the US. Ann (Anna Belle) McGovern married Fredrick Moulton on January 31, 1917. Had 3 children Mary Catherine, Frederick L and Jonathan F.
Genealogy staff in the town of Cavan, Ireland (photo on left). Here is where we found the 1900 census of Aunt Nora living with her brother Terence. At the same address in 1910 & 1920 the census registered Terence & family. Another place for genealogy would be the little building outside the hospital in Cavan. Here you may find death certificate information. We found this out at the end of our trip and did not have time to go there. It would be nice to find the death record of our great grandmother. We met Postman Brendan Baxter and Patrick McGovern. Patrick was working on a ditch at the lower end of his property. This used to be the main road from Sligo to Dublin. His father James McGovern b 1900 d 1933. Katherine wife? His Great Grand father Patrick McGovern. (There could be a connection here). 4th stop South about 1 ½ miles. Meet Tom “Paddy” McGovern, b 1930’s. Has one sister Mary Ann McGovern married Tully. Tom “Paddy” McGovern was “a hoot” to talk with. We were told he was a character in his younger days. When he was young he played Irish football in school. He always swam in river before each game and played barefoot. Paddy appears to be a fun loving character with lots of stories. When we approached his house we heard music….Beach Music…”Under the board walk,....My Girl etc” lol. When Paddy goes to town in his tractor (his only vehicle), he dresses up with tie, vest and coat. Here is a photo of him just coming back from doing business in Swanlinbar Templeport. Templeport is/was the parish Catholic Church where Aunt Nora’s (Honora McGovern) birth was registered. See sheep in field across from Hotel. Shelia was very helpful. Her mother-in-law was a McGovern (see photo of her family history). It is a lovely local Hotel, Bar and Restaurant. Sheila suggested going to Swanlinbar Templeport to talk with Agnes the butcher. She is married to John McGovern b 1956 has teenage son Sean they live on the road to and just before Altnadarragh. 7th stop Meet Joe Fee (Fey). b1932 He lives across from “Tully Dermot Falls” falls. He is sheep farmer and his vehicle is a tractor. 8th stop Maguires’ chair Interesting family story, see article attached.